Starting Monday, fans will asked to contribute funds to a statute commemorating Richard Sherman’s decisive play that sent the Seahawks to the Super Bowl. As statuary goes, Seattle is a little shy. We sculpt salutes to Hammering Man, J.P. Patches and the Fremont Troll, which are cool except for the fact that they symbolize characters, as opposed to actual doers of deeds. The statue of V.I. Lenin exists purely as Fremont’s salute to its own contrarian kitsch. We’re big on pop icons, like Ivar, Dave Niehaus and Jimi Hendrix, but Chief Seattle is among the few who could be called digniterial (a word that needed to be invented). And sadly, he lost. Sports is normally a big source of civic statuary in many places, but it’s hard to rally around five games below .500, which was more or less the case here for most of a century. The University of Washington has a statue of Jim Owens, the football coach from 1957-74, but neglected to grasp the sensibilities of African American players who were discriminated against during his tenure. In town for the unveiling in 2003, Owens spent most of his time apologizing. Now, of course, the Seahawks are champions of football, which gives them the keys to the cosmos. But besides the parade and never having to buy a drink in town again, what permanently commemorates this stupendousness? A few fans, along with former Seahawks lineman Joe Tafoya, decided that Richard Sherman’s tipped pass in the final 30 seconds of the NFC Championship against the 49ers, done at the Clink, would be highest and best portal through which generations of Seahawks fans, as well as millions of seagulls and pigeons, will go to connect to the moment the Northwest sports world changed. And for a minimum price of $12, the Twelves can help crowd-fund the project, which was introduced Monday at the website http://buildthetip.com/. Microsoft staffers Joe Michaels and Chris Bauer, in the video above done cleverly by VMG Studio 520 of Bellevue, came up with the idea. They will launch the fund drive at 12:12 p.m. Monday. For 40 days until the Sept. 4 season opener, they will solicit money via an Indiegogo campaign to cover the $250,000 estimated cost of the project. Excess funds will go to charity. Still to be determined is the exact look of the statue to be created by local artist Kevin Pettelle, perhaps best known for his sculpture of kid-TV hero J.P. Patches and confidante Gertrude. The statute will be about nine feet, including the base, making it, like Sherman, slightly larger than life. Also not yet known is the location, other than the desire to be in the vicinity of the Clink. Although the Seahawks “support” the idea, Michaels said, they are not officially part of the project. Nor do the Seahawks have a formal say in the location. The state’s public facilities district is the agency in charge of matters of public art and its display. If things seem a little fluid, it’s understandable. It’s not as if Seattle draws from a wealth of experience with the topic. Perhaps sports championships can be seen as the latest Seattle start-up. Not bad, but I’d first like to see a statue of Pete Gross, Steve Largent or Chuck Knox. That would show our appreciation for the pre-SB cornerstones of the franchise, and chasten the out-of-towers who think we’re bandwagon jumpers. All worthies, but they didn’t win the big one. Lots of builders worthy of sentiment, but not sure about a statue. 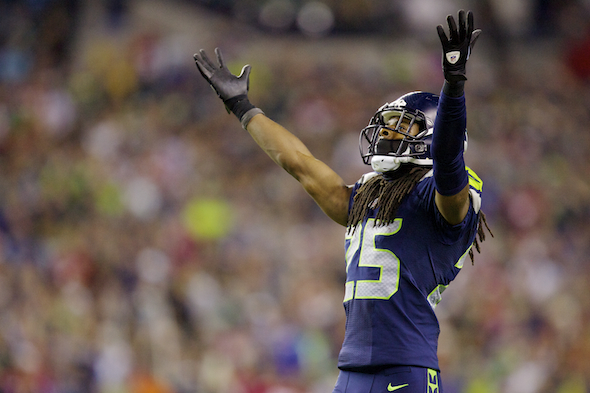 Sherm made a good play and deflected an end zone pass, but Malcolm Smith’s interception sealed the victory. Otherwise the 49rs had another shot. I thought it was exceptional for a linebacker to be there to back up a corner, yet this has never been mentioned much – certainly not as much as Sherm’s rant which had nothing to do with the outcome of the game. At least Malcolm got deserved recognition in the SB. Smith happened to be running to the right place. Sherman forced the action. It was his play. But the statue’s advocates say it represents the D’s entire work. I’m a huge fan. Even drove 160 miles to do 25’s celebrity softball game a few days back. But a quarter million? On THIS? Someone’s going to make bank off this effort. And it’s simply not worth it. There’s a lot of other places that kind of money could go to that actually would make a difference. This will not. My guess is it will be overfunded, and the extra will go to charity. People involvee will be paid for some of their time, but no one is making bank on this. You’re certainly entitled to spend as you choose. I think the statue should feature Richard Sherman giving the choke sign to a defeated opponent. About sums up the pinnacle of the organization quite nicely. I’d assume that the sculpture could include Smith; we have to have Crabtree’s face for sure. While we’re at it, I’d suggest renaming the Hammering Man (lame) to Hammering Cam. As far as we need more statues first, negative. Let’s get started with one that sealed a victorious SuperBowl trip. Then we can make one to whomever. And for once, if the fans want it and want to pay for it, let’s leave the put the money to better use argument for politics (another highlight of do nothing). If you don’t like it, don’t contribute. I am. I’d like to see Crabtree’ image reduced or eliminated.